Arecaceae (sometimes known by the alternative name Palmae), the palm family, is a family of flowering plants belonging to the monocot order Arecales. There are roughly 202 currently known genera in the palm family with around 2,600 species, most of which are native to tropical or subtropical climates. Of all the families of plants, the Arecaceae is perhaps the most easily recognizable as distinct by most people. Most palms are distinguished by their large, compound, evergreen leaves arranged at the top of an unbranched stem. However, many palms are exceptions to this statement, and palms in fact exhibit an enormous diversity in physical characteristics. As well as being morphologically diverse, palms also inhabit nearly every type of habitat within their range, from rainforests to deserts. 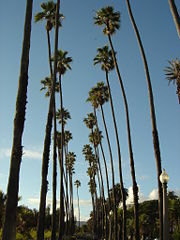 Palms are extensively cultivated. They have provided benefit to humans since the dawn of civilization, including commercially, symbolically, and aesthetically. Many common products and foods are derived from palms, and palms are also widely used in landscaping, making them one of the most economically important plants. In many historical cultures, palms were symbols for such ideas as victory, peace, and fertility. Today, palms remain a popular symbol for the tropics and vacations. Despite their value, various anthropological causes have resulted in risk to many palm species, with at least 100 species considered to be endangered. Among the causes is habitat destruction, as land is converted to various agricultural, commercial, and residential uses. Harvesting of palms or palm products also places a strain on various species. Through proper management of their relationship with palm species, human beings can allow them to continue to provide sustainable benefit to the whole, while also assisting their individual purpose to exist, develop, and reproduce. The Sago Palm (or "King Sago Palm") and the Travellers Palm, while also having the word "palm" in their name, are not true palms. The overwhelming majority of palms are found in the tropics. Palms are abundant throughout the tropical regions around the world, and are present in almost every type of habitat in the tropics. Diversity is highest in wet, lowland tropical forests, especially in ecological "hotspots" such as Madagascar, which has more endemic palms than all of continental Africa. Colombia may have the highest number of palm species in one country (Dewees 2005). It is estimated that only 130 palm species grow naturally beyond the tropics, most of which grow in the subtropics. The northernmost native palm is Chamaerops humilis, which reaches 43°N latitude in southern France where a Mediterranean climate makes weather milder than other places as far north. The southernmost palm is the Rhopalostylis sapida, which reaches 44°S on the Chatham Islands where an oceanic climate has a similar warming effect (FAO 1995). 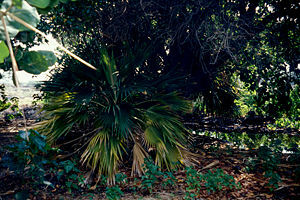 The growth habit of palms is usually a straight, unbranched stem, and rarely a dichotomous branching stem or a creeping vine-like habit (liana). They have large evergreen leaves that are either palmately ('fan-leaved') or pinnately ('feather-leaved') compound and spirally arranged at the top of the stem. The leaves have a tubular sheath at the base that usually splits open on one side at maturity. The flowers are generally small and white, radially symmetric, and may be bisexual or unisexual. The sepals and petals usually number three each and may be distinct or joined at the base. The stamens generally number six, with filaments that may be separate, attached to each other, or attached to the pistil at the base. The fruit is usually a single-seeded berry or drupe (fruit in which an outer fleshy part surrounds a pit or stone with a seed inside. Palms inhabit a variety of habitats. Over two-thirds of palms live in tropical forests, where some species grow tall enough to form part of the canopy and other shorter palms adapted to shade form part of the understory. Some species form pure stands in areas with poor drainage or regular flooding, including Raphia hookeri, which is common in coastal freshwater swamps in West Africa. Other palms live in tropical montane habitats above 1,000 meters, such as those in the genus Ceroxylon, native to the Andes. Palms may also live in grasslands and scrublands, usually associated with a water source, and in desert oases such as the date palm. A few palms are adapted to extremely basic lime soils, while others are similarly adapted to very acidic serpentine (type of rock-forming minerals) soils (FAO 1995). 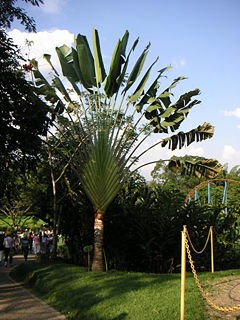 Arecaceae is notable for having individual trees with the largest seed, largest leaf, largest inflorescence, as well as for being the tallest individual monocot. The Coco de mer (Lodoicea maldivica) has the largest seeds of any plant, 40–50 centimeters (15–20 inches) in diameter and weighing 15–30 kilograms (32–65 lbs) each. Raffia palms (Raphia spp. ), with leaves up to 25 meters (90 feet) long and 3 meters (10 feet) wide, have the largest leaves of any plant. The Corypha species have the largest inflorescence of any plant, up to 7.5 meters (25 feet) tall and containing millions of small flowers. Ceroxylon quindiuense, Colombia's national tree, is the tallest monocot in the world, reaching heights of 60 meters (200 feet) (Dewees 2005). Palms are a monophyletic group of plants, meaning that the group consists of a common ancestor and all its descendants. Extensive taxonomic research on palms began with botanist H. E. Moore, who organized palms into 15 major groups based mostly on general morphological characteristics. The following classification, proposed by N. W. Uhl and J. Dransfield in 1987, is a revision of Moore's classification. It organizes palms into six subfamilies. A few general traits of each subfamily are listed. Coryphoideae is the most diverse subfamily and is a paraphyletic group, meaning that all members of the group share a common ancestor but the group does not include all the ancestor's descendants. Most palms in this subfamily have palmately lobed leaves and solitary flowers with three, sometimes four, carpels (female reproductive organ). The fruit normally develops from only one carpel. Subfamily Calamoideae includes the climbing palms such as rattans. The leaves are usually pinnate; derived characters (synapomorphies) include spines on various organs, organs specialized for climbing, an extension of the main stem of the leaf-bearing reflexed spines, and overlapping scales covering the fruit and ovary. Subfamily Nypoideae contains only one genus and one species, Nypa fruticans, which has large pinnate leaves. 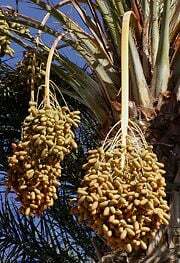 The fruit is unusual in that it floats, and the stem is dichotomously branched, also unusual in palms. Subfamily Ceroxyloideae has small to medium-sized flowers that are spirally arranged, with a gynoecium (female reproductive part of a flower, which includes the reproductive organ or carpel) of three joined carpels. Arecoideae is the largest subfamily with six diverse tribes containing over 100 genera. All tribes have pinnate or bipinnate leaves and flowers arranged in groups of three, with a central pistillate and two staminate flowers. Phytelephantoideae is a monoecious subfamily (having unisexual reproductive units of both sexes appearing on the same plant). Members of this group have distinct monopodial flower clusters. (Monopodial flowers grow upward from a single point.) Other distinct features include a gynoecium with five to ten joined carpels, and flowers with more than three parts per whorl. Fruits are multiseeded and have multiple parts. Arecaceae is the first modern family of monocots that is clearly represented in the fossil record. Palms first appear in the fossil record around 80 million years ago, during the late Cretaceous period. The first modern species, such as Nypa fruticans and Acromia aculeate, appeared 69–70 million years ago, confirmed by fossil Nypa pollen dated to 70 million years ago. Palms appear to have undergone an early period of adaptive radiation. By 60 million years ago, many of the modern, specialized genera of palms appeared and became widespread and common, much more widespread than their range today. Because palms separated from the other monocots earlier than other families, they developed more intrafamilial specialization and diversity. By tracing back these diverse characteristics of palms to the basic structures of monocots, palms may be valuable in studying monocot evolution (Haynes 1998–2006). An indication of the importance of palms in ancient times can be surmised from the fact that they are mentioned more than 30 times in the Bible. 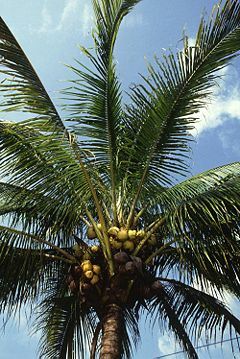 The coconut palm has the same kind of importance to peoples living on the shores of the tropical Pacific and Indian oceans. Other useful palms include the areca palm, the type member of the Arecaceae family, the fruit of which, the betel nut, is chewed along with the betel leaf for intoxicating effects. Rattans' stems are used extensively in furniture and baskets. Palm oil is an edible vegetable oil produced by the oil palms in the genus Elaeis. Several species are harvested for heart of palm, a vegetable eaten in salads. Palm sap is sometimes fermented to produce palm wine or toddy, an alcoholic beverage common in parts of Africa, India, and the Philippines (Gallant 2005). Dragon's blood, a red resin used traditionally in medicine, varnish, and dyes, may be obtained from the fruit of Daemonorops species. Coir is a coarse, water-resistant fiber extracted from the outer shell of coconuts, used in doormats, brushes, mattresses, and ropes. Some indigenous groups living in palm-rich areas use palms to make many of their necessary items and food. Palm leaves are also valuable to some people as a material for thatching or clothing. Today, palms are valuable as ornamental plants and are often grown along streets in tropical and subtropical cities, and also along the Mediterranean coast in Europe. Farther north, palms are a common feature in botanical gardens or as indoor plants. Few palms tolerate severe cold, however, and the majority of the species are tropical or subtropical. In the United States, the southeastern state of South Carolina is nicknamed the “Palmetto State” after the cabbage palmetto, logs from which were used to build the fort at Fort Moultrie. During the American Revolutionary War, they were invaluable to those defending the fort, because their spongy wood absorbed or deflected the British cannonballs. 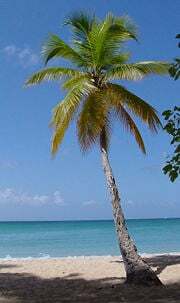 Some palms can be grown as far north as Maryland, Arkansas, and even up along the Pacific coast to Oregon, Washington, and British Columbia in Canada, where ocean winds have a warming effect. Various species of palms have been threatened by human intervention and exploitation. The greatest risk to palms is destruction of habitat, especially in the tropical forests, due to urbanization, wood-chipping, mining, and conversion to farmland. Palms rarely reproduce after such great changes in the habitat, and palms with a small habitat range are most vulnerable to the effects. At least 100 palm species are currently endangered, and nine species have reportedly become extinct recently (Haynes 1998-2006). Direct use of palms in the wild causes stress on some species. For example, the harvesting of heart of palm, a delicacy in salads, poses a threat because it is derived from the inner core of the tree and thus harvesting kills the tree. The use of rattan palms in furniture has caused a major population decrease in these species that has negatively affected local and international markets, as well as biodiversity in the area (Johnson 1996). The sale of seeds to nurseries and collectors is another threat, and the seeds of popular palms are sometimes harvested directly from the wild. However, several factors make palm conservation difficult. Palms live in almost every type of habitat and have tremendous morphological diversity. Most palm seeds lose viability quickly, but they cannot be preserved in low temperatures because the cold kills the embryo. Using botanical gardens for conservation also presents problems, since they can only house a few plants of any species and cannot truly imitate the natural setting. The Palm Specialist Group of the World Conservation Union (IUCN) created in 1984 has performed a series of three studies in order to find basic information on the status of palms in the wild, utilization of wild palms, and palms under cultivation. Two projects on palm conservation and utilization supported by the World Wildlife Fund took place from 1985 to 1990 and from 1986 to 1991, in the American tropics and Southeast Asia, respectively. Both studies produced a large amount of new data and publications on palms. Preparation of a global action plan for palm conservation began in 1991, supported by the IUCN, and was published in 1996 (Johnson 1996). The palm branch was a symbol of triumph and victory in pre-Christian times. The Romans rewarded champions of the games and celebrated military successes with palm branches. The motto of the HMS Nelson, a British battleship that fought in World War II, was "Palmam qui meruit ferat," which means in Latin, "Let him bear the palm who has deserved it." Palm stems represented long life to the ancient Egyptians, and the god Huh was often shown holding a palm stem in one or both hands. The Mesopotamian goddess Inanna, who had a part in the sacred marriage ritual, considered herself the one who made the dates abundant (Mller 2000). The sacred tree in Assyrian mythology is a palm that symbolizes Ishtar connecting heaven, the crown of the tree, and earth, the base of the trunk. The palm tree was a sacred sign of Apollo in ancient Greece because he had been born under one in Delos. It is said that Muhammad built his home out of palm wood, and the palm symbolizes rest and hospitality in many cultures of the Middle East. In Judaism, the palm represents peace and plenty, and is one of the four species of Sukkot; the palm may also symbolize the Tree of Life in Kabbalah. Early Christians used the palm branch to symbolize the victory of the faithful over enemies of the soul, as in the Palm Sunday festival celebrating the triumphal entry of Jesus into Jerusalem. In Christian art, martyrs were usually shown holding palms representing the victory of spirit over flesh, and it was widely believed that a picture of a palm on a tomb meant that a martyr was buried there (Hassatt  2007). Palms also represented heaven, evidenced by ancient art often depicting Jesus in heaven among palms. Today, the palm, especially the coconut, remains a symbol of the stereotypical tropical island paradise. Palms appear on the flags and seals of several places where they are native, including those of Haiti, Guam, Florida, and South Carolina. Cycas revoluta, the Sago Cycad, is a cycad native to southern Japan, but is now grown worldwide. Though often known by the common name of king sago palm, or just sago palm, it is not a palm at all, but a type of gymnosperm. This very symmetrical plant supports a crown of shiny, dark green leaves on a thick shaggy trunk that is typically about 20 cm (8 inches) in diameter, sometimes wider. The trunk is very low to subterranean in young plants, but lengthens above ground with age. It can grow into very old specimens with 6–7 meters (20–25 feet) of trunk; however, the plant is very slow-growing and requires about 50–100 years to achieve this height. Trunks can branch multiple times, thus producing multiple heads of leaves. The leaves are a deep, semiglossy green and about 50–150 centimeters (2-4 feet) long when the plants are of a reproductive age. They grow out into a feather-like rosette to 1 meter in diameter. The crowded, stiff, narrow leaflets are 8–18 centimeters (3–7 inches) long and have strongly recurved or revolute edges. The basal leaflets become more like spines. The petiole or stems of the sago cycad are 6–10 centimeters (2-4 inches) long and have small protective barbs that must be avoided. Propagation of Cycas revoluta is either by seed or by removal of basal offsets. 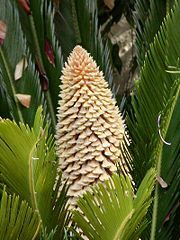 As with other cycads, it is dioecious, with each specimen bearing either male or female cones. Pollination of receptive female cones can be done naturally by insects or artificially. Cycas revoluta grows best in sandy, well-drained soil, preferably with some organic matter. It needs good drainage or it will rot. It is fairly drought-tolerant and grows well in full sun or outdoor shade, but needs bright light when grown indoors. Leaf color can bleach somewhat in full sun. The pith is very rich in edible starch, and is used for making sago, a popular food item in some countries. Before use, the starch must be carefully washed to leach out toxins contained in the pith. 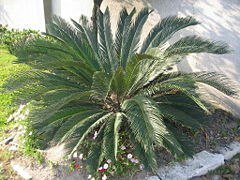 Of all the cycads, the sago palm is the most popular in horticulture. It is seen in almost all botanical gardens, in both temperate and tropical locations. In many areas of the world, it is heavily promoted commercially as a landscape plant. It is also quite popular as a bonsai plant. First discovered in the late 1700s, it is native to various areas of southern Japan and is thus tolerant of mild to somewhat cold temperatures, provided the ground is dry. Frond damage can occur at temperatures below −5°C (20°F). It does, however, require hot summers, with mean temperatures of 30° to 35°C (85° to 95°F), for successful growth, making outdoor growing impossible in northern Europe even where winter temperatures are not too cold. Ravenala madagascariensis, the Travellers Palm, is native to Madagascar. It is not actually a palm but a member of the banana family, and is called the travellers palm because the stems hold rainwater that can be used as an emergency drinking supply. The enormous banana-like leaves are borne in a highly unusual fan shape, being aligned in a single plane. It is grown as an ornamental plant in many parts of the world. It grows to about 7 meters (24 feet) tall. It is related to the bird-of-paradise flower, Strelitzia reginae. Byzantines.net. 2006. 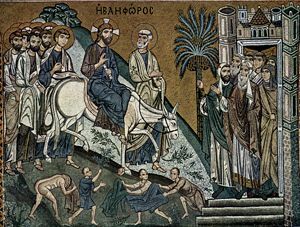 Palm Sunday According to the Byzantine Rite Tradition. Retrieved June 14, 2007. Dewees, J. 2005. Palms. Conservatory of Flowers. Retrieved June 14, 2007. Zona, Scott. 2006. Arecaceae. In Flora of North America Vol. 22, ed. Flora of North America Editorial Committee. Oxford University Press. Retrieved June 14, 2007. Food and Agricultural Organization of the United Nations (FAO). 1995. Tropical Palms. Retrieved June 14, 2007. Gallant, H. 2005. Palm Trees: Uses and Locations. Retrieved June 14, 2007. Hassett, M.  2007. Palms in Christian Symbolism. In The Catholic Encyclopedia, vol. XI. K. Knight. Retrieved June 14, 2007. Haynes, J. L., ed. 1998–2006. Virtual Palm Encyclopedia. Retrieved June 14, 2007. Højgaard, A., J. Jóhansen, and S. Ødum. 1989. A Century of Tree Planting on the Faroe Islands. Ann. Soc. Sci. Faeroensis Supplementum 14. Johnson, D. 1995. Palm Conservation: Its Antecedents, Status, and Needs. Retrieved June 14, 2007. Johnson, D., ed. 1996. Executive Summary. In Palms: Their Conservation and Sustained Utilization. Cambridge, UK: IUCN Publications Services Unit. Retrieved June 14, 2007. Sayan, M. S. 2001. Landscaping with Palms in the Mediterranean. Palms 45(4). Retrieved June 14, 2007. Schultz-Schultzenstein, C. H. 1832. Natürliches System des Pflanzenreichs. Berlin, Germany. Uhl, N. W., and J. Dransfield. 1987. Genera Palmarum: A Classification of Palms Based on the Work of Harold E. Moore, Jr. Lawrence, KS: Allen Press. This page was last modified on 25 April 2008, at 21:52.